The Institute of Experimental Pharmacology & Toxicology is located in the campus of Slovak Academy of Sciences in Bratislava, capital of Slovakia, along with the majority of other institutes of the Academy. The campus is situated to the north west from the city centre and can be reached easily, thanks to its convenient location close to the communication Bratislava – Brno – Praha. Although Bratislava Airport is relatively distant, a dense network of city buses and the proximity of city bus network junction named “Patrónka” ensures quick and easy access to the campus. Also, Vienna’s Schwechat Airport is less than 70 km (approx. 40 miles) away and there are direct city buses from and to Bratislava’s main railway station (10 min ride) and main bus station (15 min ride). 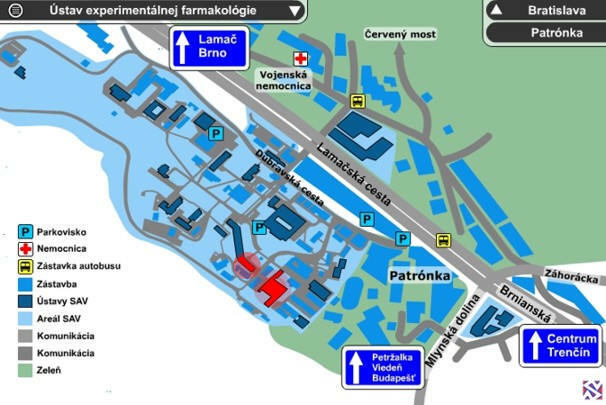 The department of Toxicology and Laboratory Animal Breeding of the IEPh SAS is located at DOBRA VODA, near Trnava.